Chakras (Tib. khorlo) are in the esoteric a topic under discussion because of the ignorance of the forces involved. Some interpretations speak of an energy body with 14 main Nadis(energy channels) Sushumna, Ida, Pingala, Gandhari, Hastajihva, Yashasvini, Pusha, Alambusha, Kuhu, Shankini, Payasvini, Sarasvati, Varuni and Yashodhara with associated chakras (energy centers). Some scriptures assign certain levels of consciousness or even planes of creation to the chakras. By default the Chakras are assigned to the Pranamaya Kosha, but their content changes with the individual development. 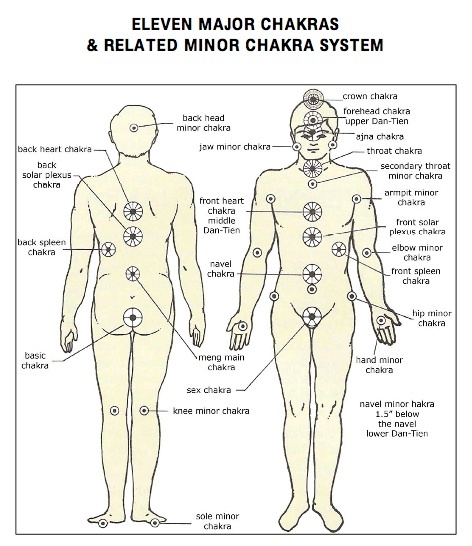 The chakras also influence other higher bodies. The Kundalini - snake passes these chakras and three knots on her way to the Sahasrara-Chakra and above to the cosmic Shesha. In esoteric symbolism, a chakra is often symbolized as a 'city'. Manipura means 'City of Jewels'. Another example is the tantric goddess Lalita, also known as Tripura Sundari ('Beauty of the Three Cities'). These three cities refer to the three lower chakras and their higher aspects. In the Mahabharata, Brahma's city Hiranyapura is mentioned. In the indian Shat Chakra Nirupana (Sans. Ṣaṭcakranirūpaṇa) at least seven main chakras are mentioned as well as a series of secondary chakras. Each big chakra is assigned an indwelling deity, a creation plane as well as a tantric bija mantra like: sahasrara : Paramashiva; Ajna :Shambhu; Visuddha : Kaumari - Sadashiva; Anahata : Vaishnavi - Ishvara ; Manipura : Varahi - Vishnu; Svadhisthana : Indrani - Rudra; Muladhara : Chamunda - Brahma. The assignments vary in some schools. After the Vairata-Purana, the Amrita-Chakra is located in the upper part of the forehead where the nectar is constantly descending. This place is described as the whereabouts of Gayatri called Kamadhenu (in the script the so-called wonderful desire-filling cow) with the four Vymyami: Ambika, Lambika, Ghantika and Talika. According to Satguru Sivaya Subramuniyaswami, there are seven further underworld chakras under the Muladhara. 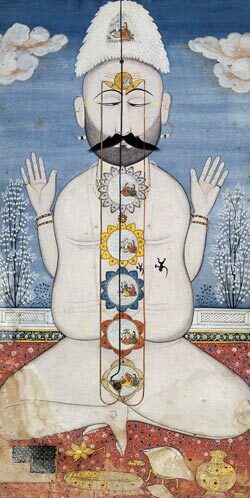 Also Kashmiri Shivaism knows further front-chakras such as nabhi- chakra (navel), hrit (heart), kantha kupa (throat), and bhrumadya who are a theme in Tantra. In Ayurveda and in the Sushruta-Samhita, 107 so-called Marma points are mentioned, which resemble the acupressure points of Chinese medicine. For this purpose the theory of a Marma - Nadi-system was developed. The Yogatattva Upanishade (slokas 83-101) relates the five lower chakras to the five elements. In the Hathapradipika (3rd chapter, verse 73), even the Madhya Chakra or Vishuddha Chakra is described in more detail with the 16 Adharas ("Supports") and petal leaves and their germs. In the Shivasamhita, 7 chakras and their bijas are described. Chakras are also described in the Yoga Kundalini Upanishad, in the Yoga Sikha - Upanishad, in the Dhyana Bindu Upanishad and in the Jabala Darshana Upanishad. After the Vairatapurana, the Amritachakra is located in the upper part of the forehead where the nectar is constantly descending. This place is described as the abode of Gayatri called Kamadhenu (in the script the so-called wonderful desire-filling cow) with the four Vymyami: Ambika, Lambika, Ghantika and Talika. The Shiva-Purana says in chapter 17 : But those who only recite one single mantra with full concentration, come to the Wheel of Time, Kalachakra, the first of the realms of Shiva. The Kalachakra consists of five wheels, one above the other. Insight and confusion (drsti, moha), form the Brahmachakra; Joy and deception (bhoga, moha) the Vishnuchakra; Wrath and Illusion (kopa, moha) - the Rudrachakra, brahmana is the Ishvarachakra, and knowledge and delusion (jnana, moha) are the Shivachakra. This explains the five chakras to the students. -- It counts above the Ajna Chakra three more: Shakti, Shanti and Shantyatzta. Goraksanath mentions other chakras distributed in the body. In the Kabbalah 10 Sephiroth - energy - centers(cores) are mentioned with center in the heart region. 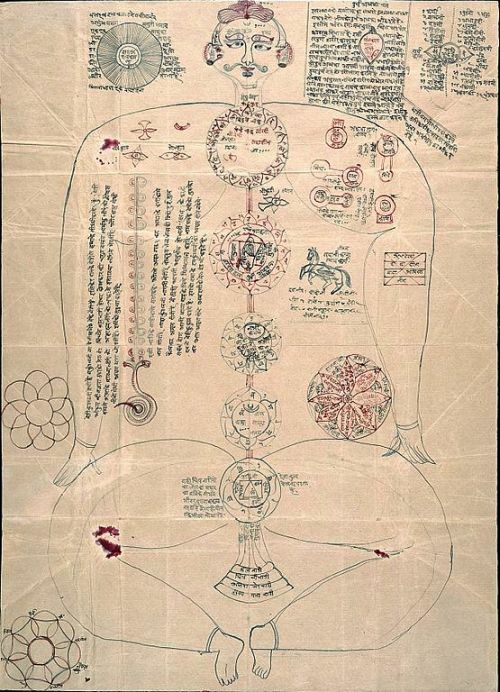 In Buddhism, chakras (Tib. khorlo) are mainly mentioned in the Vajrayana in content with energy-channels. They sometimes serve as meditation objects and are detailed during inaugurations. Tantric Buddhism, however, develops the mind, the Sahasrara and the heart, and thus the Trikaya. The Dharmachakra, the wheel of the law, is the symbol of Buddha's teachings in Buddhism. The Bhavachakra symbolizes cyclic existence in samsara. The Kalachakra(wheel of time) refers to a tantric sadhana.